In stock 124 items in stock. Screw Terminals with 5mm pitch pins. Comes in 2 or 3 positions and have the really cool feature of slide-locking together to form any size you need (4, 5, up to 20 without problems). Rated up to 300V @ 8A. 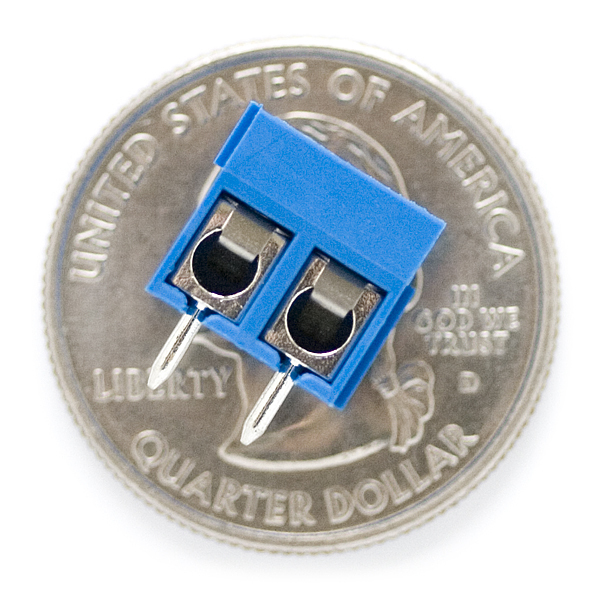 Terminal can accept 26 to 14AWG wire. 5mm/197mil pin pitch will line up well with standard 0.1" perf boards but the pins are thick enough (1.0mm OD) that you may need to increase the hole diameter on some perf boards. Which direction do these go in the Eagle library? Is the front the end with the little circle or the long rectangle? In Eagle, what is the correct spacing for 'interlocking'? Should the larger rectangle footprint be touching each other with the smaller squares overlapping into adjacent footprint? I believe there's a minor typo in the Sparkfun Library - M025MM references PRT-08433, but that is the 3 pin terminal. It should say PRT-08432. Double check that you have the updated library. I think we already addressed this issue. I can't find the part in the Fritzing library - all I can see is shields, sensors, lilypads, and breakout boards. Is there something I'm missing?? Will the pins fit in Sparkfun's Arduino proto shield, or will the holes on that board need to be increased as well? It will, It takes up a bit of space, but it does fit. I should have said, I am having problems finding this part in the SparkFun Eagle library. It's under the M02 part. M02 is a 2-pin device with lots of different footprints. 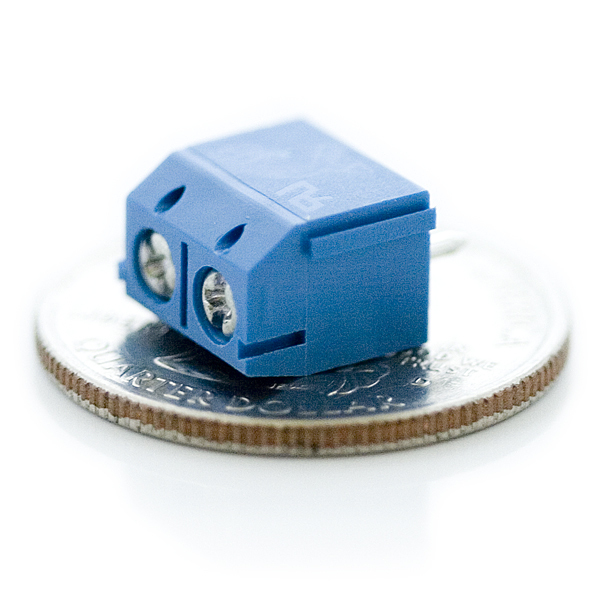 You're looking for the last one on the list - 'M025MM' (M02, 5MM FP). Thanks that helped me too. I am having trouble finding this part in the Eagle library. What is the name of the part? (I am just starting out with Eagle). 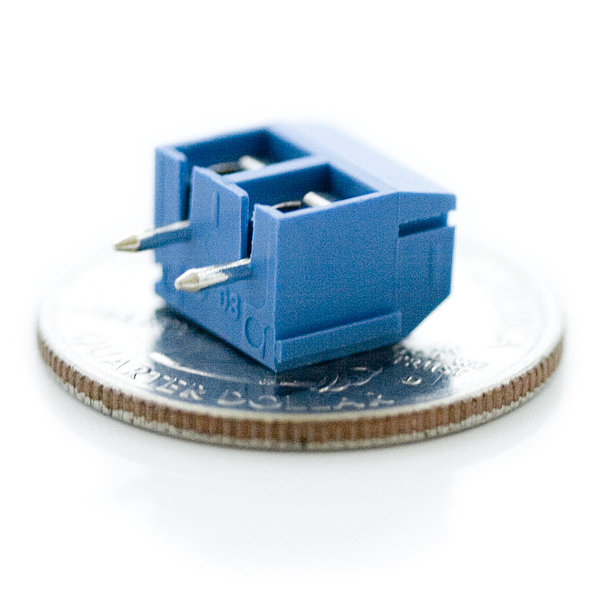 These screw terminals are perfect for placing on a breadboard for temporary projects.